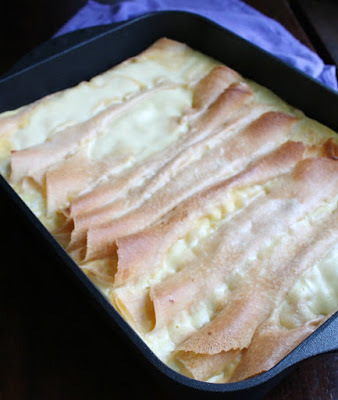 Crepes stuffed with sweet cottage cheese filling and topped with a custard baked to perfection. Top with fruit or a sprinkling of powdered sugar for a great treat. If you are looking for a fun new breakfast, brunch or dessert recipe, you have come to the right place! These crepes are filled with sweet creamy goodness. 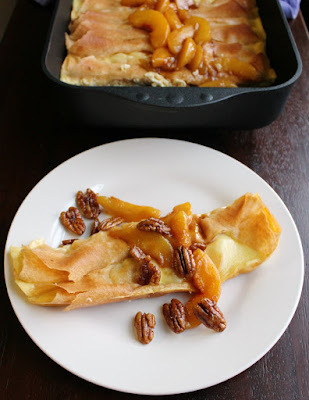 They go perfectly with spiced peaches but would also be great served with fresh berries. Hooray! It's crepe day! In full disclosure, I have never celebrated crepe day. But when Audrey from That Recipe mentioned it a few days back, I took notice. 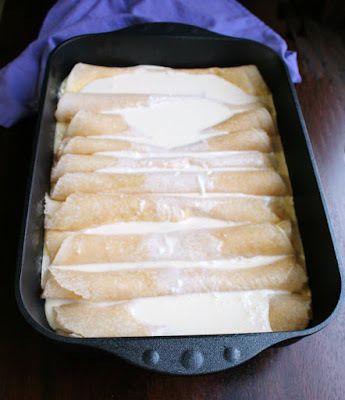 It would be the perfect time to share this fun recipe for cottage cheese stuffed crepes. Audrey mentioned a little bit about the holiday in her post and a little more background can be found here. It is fun to read about the superstitions. I had better practice flipping crepes with my left hand! In the end, I find any excuse to eat crepes must be a good one! I actually made these a week or two ago and today seemed like just the right day to share them with you. They are a sweet baked crepe, but are choc full of protein as well. There is a whole tub of cottage cheese and quite a few eggs in here. The filling ends up reminiscent of a cheesecake type filling with a delicious custard over the top. This would be a perfect brunch dish served with fruit. 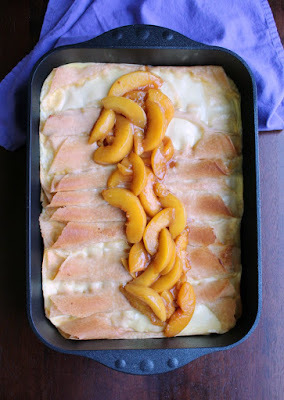 I served ours with some cinnamon spiced peaches and they were delicious together! We had ours warm the morning I made them and they were wonderful that way. I also ate one of the leftover crepes cold and it was great that way too. I think this is one of those dishes you could serve any temperature and be happy. I am considering making a couple of batches more for an Easter brunch. You can make the crepes ahead of time and all you would need to do is stuff and bake them. I haven't tried it, but I can't see how it would hurt to stuff them the evening ahead. When you were ready to serve them, it would just take a minute or two to top them with the custard and throw them in the oven. I would just add a few minutes to the bake time to compensate for them starting of cold. They weren't the most photogenic, but they were delicious. I may have to make them again soon and let them sit a bit longer before serving to see if I can get better pictures. We were too excited to wait with this batch! For the filling, lightly beat the eggs, stir in the sugar, cottage cheese (pour off any excess whey), vanilla and lemon juice. Spoon about 4 T of filling into each crepe. Roll and place seam side down in the prepared pan. For the custard sauce, lightly beat egg and stir in remaining ingredients. Pour over top of stuffed crepes. They serve easier if you let them sit for a few minutes before trying to dish them out. You can serve them warm or at room temperature. The title of this recipe makes me feel like I should be sitting and little bistro in Paris eating them! I bet they are absolutely wonderful and I would love to try them for a brunch! We really enjoyed them! We started a new tradition of having an open house for our family and friends around Easter. I would love to do it as a brunch this year and make a few more trays of these! Have a great day, Andrea! Truth: I've never had a crepe before...they sound great though! I plan on trying these. Thanks so much for sharing at Inspiration Thursday! Well then you have to give crepes a try. 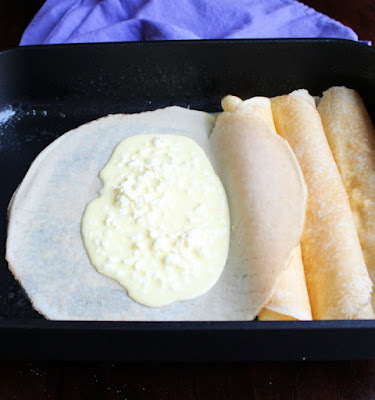 Honestly I've had more savory stuffed crepes than sweet ones (which is really strange for me) but there are so many things you can do with them. One of these I'm going to have to make one of those tortes with layers of crepes and filling stacked so high it turns into a cake! 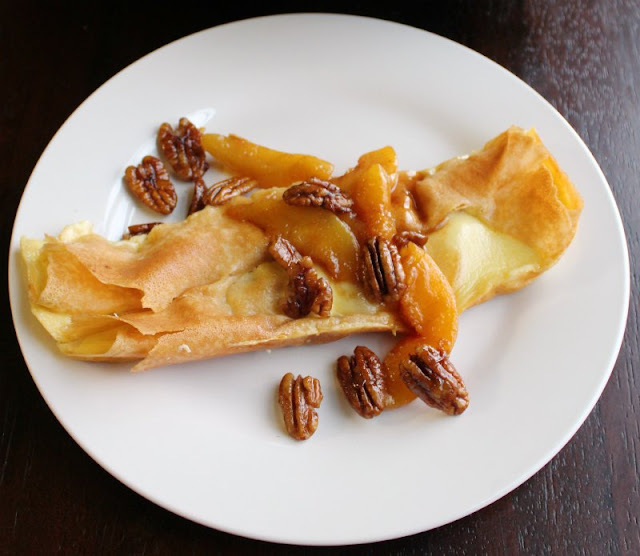 These crepes sound like the perfect brunch! I better pin it and save it for later. My family would love these. They are a fun way to have crepes. I can't wait to make them again! What a great dessert, I can't wait to try this one! Thank you so much for sharing with us for our 5th Anniversary of Full Plate Thursday! Hope you have a fantastic week and hope to see you again real soon! This was a lot of fun! We all really loved it, even if it didn't take the prettiest pictures. Thanks as always, Miz Helen! Oh I need to try this one it sounds delicious and I love crepes with a savoury filling. Thanks for sharing with us at #Overthemoon it might be a great Valentine's brunch recipe to try. It would be perfect for a Valentine's brunch! Thanks, Sue! I think I saw these on Instagram when you made them? Wherever I saw them, I was hoping you would share the recipe! I know my husband will LOVE them! I'm wondering if you couldn't hit the filling with an immersion blender to smooth out the texture. Otherwise, I would think ricotta would work great too!